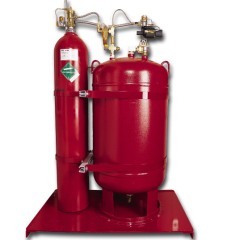 Kidde Fenwal FM-200 fire suppression systems an environmentally-friendly, Halon 1301 replacement agent, which offers the most versatile clean agent suppression capabilities available for facilities that cannot afford fire-related business interruptions. Safe for occupied spaces, (non-toxic when used in accordance with NFPA Standard 2001) FM-200 leaves no residue on Class A, B, and C fires. FM-200 systems provide maximum protection with minimum hardware, require minimal space, and are extremely cost effective. FM-200 systems are UL/ULC listed and FM approved. Novec 1230 is an environmentally safe, clean agent, and sustainable chemical that extinguishes (disrupts) a fire by absorbing the heat (a cooling effect). Because it is non-conductive and non-corrosive, this fluid that works as a gas, will not damage the area or the engine components that it is designed to protect. Most importantly, it leaves no residue therefore, there is no costly or time-consuming clean up necessary after a discharge. Carbon dioxide or CO2 is an environmentally safe gas that is colorless, odorless, electrically non-conductive … and highly efficient as a fire suppression agent. Carbon Dioxide fire protection systems use intelligent, reliable and fast-acting control panels to quickly sense a fire before it can cause damage to property. Carbon dioxide gas has a high rate of expansion, which allows a CO2 fire protection system to work fast. When applied to a fire, CO2 provides a heavy blanket of gas that reduces the oxygen level to a point where combustion cannot occur. Since carbon dioxide is a gas, there is no clean-up associated with a CO2 fire suppression system discharge … that’s minimal interruption to your business! In fact, the cost of clean-up and peripheral damage associated with water sprinkler systems, foam systems, and dry chemical agents can exceed the costs associated with the actual fire damage. With a Carbon Dioxide system, clean up costs and downtime associated with a CO2 discharge are negligible. A watermist fire suppression system produces a fine mist to extinguish fires quickly and with very little residual water — making it safe fire protection for everything from occupied spaces to valuable assets. That is efficient, controlled protection not found with many traditional fire protection options such as fire sprinklers. The watermist fire protection systems use single fluid, intermediate pressure, reducing high installation and maintenance costs associated with redundant piping networks and high pressure piping and fittings. 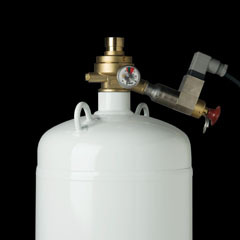 The convenient watermist system is a self-contained, single-fluid, pre-engineered water mist fire suppression system offered in 70 and 112 gallon (265 and 423 liter) cylinder configurations. Each watermist fire suppression system is pre-assembled, tested and packaged with all necessary valves and actuation components for system operation, (though system nozzles must be ordered separately). That’s portability, reliability and simple installation in one easy package! This cost-effective water mist system employs a brass nozzle, which has demonstrated excellent performance extinguishing flammable liquid (Class B) fire scenarios. The watermist fire protection system is ideally suited for total compartment protection of machinery spaces, compartmentalized gas turbine generators (FM approved) and many other applications. ECARO-25, utilizing HFC-125 (DuPont FE-25) as the fire-extinguishing agent, is the best, most cost-effective clean agent fire protection system available. 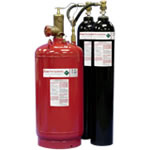 ECARO-25 is perfect for NEW clean agent fire suppression applications, as well as for Halon replacement projects. 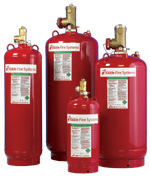 This highly effective fire suppression system is safe for people, assets and the environment. ECARO-25… THE FUTURE in Clean Agent Fire Suppression. With an ECARO-25 system, you are getting the premier design in clean agent. All clean agents must remain in the protected space for a specified period of time in order to extinguish a fire. ECARO-25 is 20% more efficient in hold time than an HFC-227ea or FM-200 System, and you need 20% less agent to protect the same room. Superior design and cost savings!